Here is the list of the hotels near Saint-Maur-des-Fossés. Book your hotel near Saint-Maur-des-Fossés today, Thursday 09 May for the best price, reservation and cancellation free of charge thanks to our partner Booking.com, leader in on-line hotels reservation. Below here is the list the 50 closest hotels of Saint-Maur-des-Fossés, sortable according your criteria. You will find the position of these accommodations on the Saint-Maur-des-Fosses hotels map. Residence Créteil Preferred hotel ! Guest accommodation Champigny-sur-Marne Preferred hotel ! Located 9 km from Paris in Champigny-sur-Marne, this resort offers self-catering bungalows set in an 8-hectare park. Disneyland Paris is a 25-minute drive away and free parking is available on site. Bungalows at Camping Paris-Est are simply furnished and have a terrace leading onto the surrounding gardens. They feature a kitchen area with a microwave, fridge and freezer and a separate seating area with a sofa. For light meals and a variety of drinks, guests can head to the resort’s restaurant and bar and enjoy the terrace when the weather is nice. Additional services available on site include a TV room with an internet access point. Tremblay Park is located 500 metres from the resort. There is a bus stop opposite the resort, which provides direct access to Joinville-le-Pont RER train station. Apartment Nogent-sur-Marne Preferred hotel ! Bed and Breakfast Noisy-le-Grand Preferred hotel ! Le Vieux Puits is set in Noisy-le-Grand, 18 km from Paris and 8 km from Marne-la-Vallée. Bry-sur-Marne RER Station is 550 metres from the property. All rooms have a private bathroom. There is a shared kitchen at the property. You can play table tennis at the guest house. Versailles is 40 km from Le Vieux Puits, while Villepinte is 26 km from the property. Paris - Charles de Gaulle Airport is 24 km away. Apartment Sucy-en-Brie Preferred hotel ! Sweet Home Apartment is located in Sucy-en-Brie and offers barbecue facilities, a garden and a terrace. Guests staying at this apartment have access to a fully equipped kitchen. This 2-bedroom apartment includes 1 bathroom equipped with a shower. A flat-screen TV is featured. Paris is 19 km from the apartment. Paris - Orly Airport is 19 km from the property. Bed and Breakfast Bry-sur-Marne Preferred hotel ! Featuring free WiFi, Chambre Avec Jardin Pierre Curie is 1 km from Bry-sur-Marne RER Station, providing direct access to Paris and Disneyland Paris. The suite include a seating area with a flat-screen TV and a DVD player. It also has a coffee machine and a kettle, as well as free toiletries and a hairdryer. You will find babysitting service at the property. Paris is 14 km from Chambre Avec Jardin Pierre Curie, while Marne-la-Vallée is 28 km from the property. Paris - Orly Airport is 22 km away. Hotel Maisons-Alfort Preferred hotel ! Hôtel Moderne is located in Maisons-Alfort, just 500 metres from Maison-Alfort RER D Train Station. Free Wi-Fi access is available throughout. The rooms feature a flat-screen TV with cable channels and a desk. Some of the rooms have a private bathroom with shower and some feature a shared bathroom. A buffet breakfast is available each morning in the communal lounge with an additional cost. You will also have access to a shared microwave and a vending machine at the reception. Restaurants can be found 100 metres away. Maisons-Alfort – Alfortville Metro Station (Line 8) is 1 km from the property and gives you direct access to central Paris. Orly Airport is 12 km away. Hotel Le Perreux-Sur-Marne Preferred hotel ! 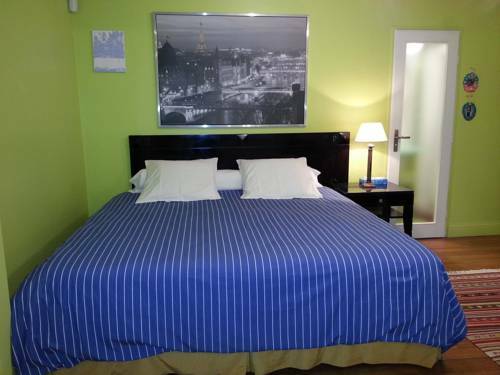 La Terrasse is a hotel located in the city centre of Le Perreux. It offers a traditional restaurant, a garden and a bar. The en suite rooms all include a flat-screen TV and free Wi-Fi access is provided. The rooms at La Terrasse have a private bathroom with free toiletries and shower. A telephone is included in all of them. A buffet breakfast is available every morning and can be brought to the comfort of your room. A room service is also available on site. The hotel is situated 10 km from the capital and 25 km from Disneyland Paris Attraction Park. Nogent-Le Perreux Train Station is a 15-minute walk away. Apartment Champigny-sur-Marne Preferred hotel ! Hotel Champigny-sur-Marne Preferred hotel ! Comfort Hôtel Champigny Sur Marne is located in Champigny-sur-Marne, 12 km east of Paris and a 30 minute drive from Disneyland Paris. Free Wi-Fi is available throughout the hotel. Each guest room at the Comfort Hôtel Champigny Sur Marne is furnished with a flat-screen TV and a work desk. They also have a private bathroom. A daily buffet breakfast is served every morning. The Comfort Hôtel also provides a free, closed car park. Villiers-sur-Marne Le Plessis-Trevise Train Station (RER E), is a 5-minute bus ride away and provides direct access to central Paris. The Château de Vincennes is 9 km away. Conveniently located near the Joinville-le-Pont RER station, the Hipotel Paris Hippodrome offers quick and easy access to Paris. It features comfortable and good value accommodation. The rooms at the Hipotel are homey and fitted with all the facilities you will need including tea and coffee making facilities. The generous buffet breakfast is served daily in the dining room, and the restaurant proposes buffet-style traditional French cuisine. The Hipotel Paris Hippodrome boasts a peaceful setting near the Hippodrome de Vincennes, the parks and forest. Located in Bry-sur-Marne, City Résidence is a 5-minute walk from Bry-sur-Marne RER station and provides direct access to the Arc de Triomphe in central Paris and the Disneyland Resort® Paris. Each apartment or studio at the City Résidence Marne-La-Vallée features a simple and contemporary décor, satellite TV and a private bathroom. Each living room opens up on a private garden. Duplex apartments also have a private terrace with outdoor furniture. Bed linen and towels are provided on arrival. Apartments are cleaned and linen changed weekly. Guests have access to the garden and free Wi-Fi is available throughout the residence. Private parking is available on site. The Roissy-Charles de Gaulle Airport and Orly Airport are 30 minutes away. B&B Hôtel La Queue En Brie provides free WiFi and rooms with air conditioning in La Queue-en-Brie. All rooms feature a flat-screen TV with cable channels and a private bathroom. At the hotel, each room comes with a desk. The units feature a wardrobe. A buffet breakfast is available each morning at B&B Hôtel La Queue En Brie. Paris is 20 km from the accommodation, while Marne-la-Vallée is 25 km away. The nearest airport is Paris - Orly Airport, 22 km from B&B Hôtel La Queue En Brie. The Hotel is located in la Varenne, a few minutes from Paris and a few steps from the river bank of La Marne. The Saint Alban Hotel is an ancient mansion completely restored with elegance and sobriety. In a refined and a friendly atmosphere, you shall enjoy the quality of our many facilities : meeting rooms for seminars, conferences, exhibitions, recreation rooms for the children, 16 bedrooms and 2 apartments pleasantly decorated. This hotel is located 500 metres from La Varenne Chennevieres RER Station. Located in Bry-sur-Marne in the Ile de France region, Chambre stagiaire features a terrace. The homestay, set in a building dating from 2000, offers free WiFi. This homestay is equipped with a fully equipped kitchen, a dining area and a flat-screen TV. Hiking can be enjoyed nearby. Paris is 15 km from the homestay, while Marne-la-Vallée is 23 km from the property. The nearest airport is Paris - Orly Airport, 21 km from Chambre stagiaire. Featuring a garden and free WiFi, Parisgaja is situated in Maisons-Alfort. Guests can make use of a shared lounge. An Asian breakfast is served daily at the property. Paris is 10 km from the guest house, while Marne-la-Vallée is 32 km away. Paris - Orly Airport is 15 km from the property. Maison d'hôtes Paris Riverside is offering accommodation in Saint-Maur-des-Fossés. All rooms boast a kitchen and a private bathroom. Free WiFi is available. The units in the guest house are fitted with a flat-screen TV. All guest rooms are equipped with a seating area. Paris is 15 km from Maison d'hôtes Paris Riverside. The nearest airport is Paris - Orly Airport, 18 km from the accommodation. Euro Hotel Paris Creteil is located just 6 km from central Paris and 15 km from Disneyland. Its rooms are en suite and have satellite, flat-screen TV. Wi-Fi and private parking are both free of charge. Each room is accessible y a lift and has electric heating and a private bathroom with a hairdryer and a bath. Towels and bed linen are provided. The restaurant in the Euro Hotel Paris Creteil serves traditional cuisine. It offers set menus and à la carte options. A buffet breakfast can be enjoyed every morning. This Euro Hotel is 7 minutes by car from the A86 and A4 motorways which offer access to Charles de Gaulle Airport and Versailles. It is 5 minutes walking distance from the metro station of the line 8, Pointe du Lac. It is 3 km from La Plage Bleue park, which has a lake. Hotel Saint Maur Créteil, Futur Ibis Styles is located by the River Marne, on the outskirts of Paris. Bois de Vincennes Park and the Racecourse of Paris-Vincennes are a 5-minute drive away. The hotel features modern rooms with free WiFi and comfortable furniture. They are soundproofed and non smoking. They are fitted with air conditioning. The hotel has a bar and various lounges. It is the perfect choice for business travellers as well as for families. Saint-Maur Créteil RER Station is only 750 metres away, providing direct access to Paris and Disneyland theme park. Set in Fresnes, Apt - Vue sur Lac Creteil features self-catering accommodation with a terrace and free WiFi. Guests have a private balcony. This air-conditioned apartment is fitted with 2 bedrooms, a fully equipped kitchen, a dining area and a satellite TV. Paris is 11 km from the apartment, while Marne-la-Vallée is 25 km from the property. The nearest airport is Paris - Orly Airport, 9 km from the property. Beau Studio Noisy-Le-Grand offers apartment accommodation with free WiFi in Noisy-le-Grand, 15 km from Paris and 17 km from Marne-la-Vallée. There is a seating area, a dining area and a kitchenette complete with a microwave, stovetop and a coffee machine. Towels and bed linen are provided in Beau Studio Noisy-Le-Grand and restaurants and grocers can be found within walking distance. Noisy-Le-Grand Mont d'Est RER Train Station is a 3-minute walk away and provides direct access to Disneyland Paris Amusement Park and Château de Vincennes Castle. The nearest airport is Paris - Orly Airport, 18 km from Beau Studio Noisy-Le-Grand. This 4-star Novotel is located halfway between Paris and Disneyland, 5 minutes from the Noisy RER A Train Station. It has an outdoor heated pool and a furnished terrace. Flat-screen TV with satellite and cable channels, en suite bathrooms with bath or shower and a minibar with 2 free bottles of water feature in each of the rooms. Free Wi-Fi is provided. At the Gourmet Bar you can enjoy international dishes and a buffet breakfast, which can also be served to your room. You are also invited to relax with a drink and a free newspaper in the hotel bar. A game area is available. Private parking is possible on site with an extra cost and charging stations for electric cars are available there. Guests of the Novotel Marne la Vallee can easily access central Paris and Disneyland Paris by car and public transportation by using the RER A. Located a 17-minute drive from central Paris, this Kyriad Prestige hotel offers rooms with private bathroom and a big business centre with modern facilities. A fitness centre and sauna are available on site. All of the rooms have air conditioning, TV with cable channels and hairdryer. Serviced by a lift, they are suitable for guests with reduced mobility. A buffet breakfast is served daily. The business centre can accommodate up to 130 people and consists of 4 large meeting rooms. With a 24-hour reception, Kyriad Prestige Joinville-Le-Pont is also provides a laundry service at an extra cost. Disneyland Paris theme park is a 30-minute drive away and Joinville-le-Pont RER Station is 1 km away. Located a 14-minute drive from Bois de Vincennes Park and its zoo and a few meters from the River Marne, ibis budget Saint-Maurice is a 24-hour reception hotel featuring en suite rooms. They include an LCD satellite TV. AccorHotels Arena is 7 km away and can be reached within 35 minutes thanks to the RER A. The rooms at ibis budget Saint-Maurice have a private bathroom with a shower and free toiletries. Free WiFi access is provided throughout. A buffet breakfast is served daily. The hotel is located a 12-minute walk from Joinville-le-Pont Train Station, which provides direct access to the centre of Paris in 30 minutes by train. There is an underground public car park 50 metres away on Place Montgolfier, available at a surcharge. Porte de Bercy is at 8 km, Orly Airport is at 20 km and Disneyland Paris is at 38 km. The Paris Floral Park is located 3.5 km away while Vincennes Racecourse is 1 km away. Featuring free WiFi, B&B Hôtel NOISY LE GRAND offers pet-friendly accommodation in Noisy-le-Grand. Free private parking is available on site. Every room is equipped with a flat-screen TV with cable channels. It also comes with a private bathroom equipped with a shower. Guests can enjoy breakfast every morning at an extra cost. Paris is 15 km from B&B Hôtel NOISY LE GRAND, while Marne-la-Vallée is 7.5 km away. Paris - Orly Airport is 23 km from the property. Ibis budget Sucy en Brie in Sucy-en-Brie has 2-star accommodation with a terrace. This 2-star hotel offers a 24-hour front desk and room service. Free WiFi is at guests' disposal. At the hotel, each room comes with a desk, a flat-screen TV and a private bathroom. Paris is 16 km from Hotel Ibis Budget Sucy En Brie, while Marne-la-Vallée is 32 km away. The nearest airport is Paris - Orly Airport, 15 km from the property. Located on the banks of the Marne River, Hôtel Nogentel features a business centre with equipped meeting rooms. It offers direct access to Disneyland Paris by the RER train. All rooms at the Nogentel have a private bathroom and most of them feature a bath. A TV and tea and coffee making facilities are available. A daily buffet breakfast is served and an express breakfast menu option is available. The express breakfast menu includes 1 hot drink, 1 orange juice and 1 croissant. Private parking is provided at Hôtel Nogentel, making it easy to explore the Île-de-France region by car. The RER E is a 10-minute walk away, and the RER A is 20 minutes away on foot. This gives direct access to the Arc de Triomphe and La Defense business district. Chambre d'hôtes Chez Marilé is located in the centre of Bry-sur-Marne, just 200 metres from the River Marne’s banks, and offers a garden, an indoor swimming pool and a hot tub accessible at an extra charge. Free Wi-Fi access is provided. The room is located on the top floor of a private house and features a view of the river. There is a flat-screen TV and a private bathroom with a shower and free toiletries. A continental breakfast is served daily and includes organic bread and fruit. It can be brought to your accommodation at an extra charge. You will find a choice of restaurants within 500 metres from the property. Bry-sur-Marne RER Train Station is a 20-minute walk away, with trains to take you directly into central Paris and to Disneyland. Hotel Ibis Budget Bry Sur Marne - offers accommodation in Bry-sur-Marne. Free WiFi is provided throughout and a free secured parking is available on site. Every room is fitted with a flat-screen TV with satellite channels. Rooms include a private bathroom equipped with a shower. Paris is 13 km from Hotel Ibis Budget Bry Sur Marne -, while Marne-la-Vallée is 18 km from the property. Paris - Orly Airport is 17 km away. Bus stop Europe is 2 minutes' walk from the property and serves buses 120 and 520. Bus stop Georges Méliès is a 5-minute walk and serves bus 210. The property can be reached by Autoroute A4 (exit 6 - from provincial cities and exit 8 - from Paris). A free secure parking is available. Easily accessible from the A86 and The Francilienne motorways, the hotel is situated in the south-east of Créteil, near Orly airport. The hotel’s 76 rooms provide genuine comfort in order to make your stay as pleasant as possible. All the rooms are equipped with a working area, a private shower and a TV with alarm clock. Bonneuil-sur-Marne is located 500 meters from the hotel and it is a 10-minute walk from Boissy Saint Léger RER Station. Situated in Joinville-le-Pont, just 2.6 km from Hippodrome de Vincennes, Duplex Sentenac offers accommodation with a garden and free WiFi. The property has garden views. This holiday home is fitted with a living room and a fully equipped kitchen with a dishwasher. A flat-screen TV is featured. If you would like to discover the area, hiking is possible in the surroundings. The nearest airport is Paris - Orly Airport, 17 km from the property. Located just 500 metres from Noisy-le-Grand Train Station, hotel ibis Noisy le Grand offers air-conditioned guest rooms with free Wi-Fi and satellite TV. A swimming pool with paid access is open from June to August. Each guest room is decorated in a modern style and has a view of the town. The en suite bathrooms are fitted with a bath or a shower, and they include a hairdryer. A buffet breakfast composed of sweet and savoury dishes such as eggs, fruit salad, yogurts and juices is served every day. Pastries baked on site and fresh French Madeleine cakes are also on offer, as well as a hot beverage and a piece of fruit to take away. Outside of regular breakfast hours guests can also enjoy a lighter option, available from 04:00. Traditional French meals are served in the restaurant and the bar is open until midnight. With private parking available on site, the hotel is only 15 km from Paris and a 20-minute drive from Disneyland Paris. Set in Maisons-Alfort in the Ile de France region, Towandhouse has a terrace. Free WiFi is provided. The apartment is composed of 2 bedrooms, a fully equipped kitchen, and 1 bathroom. A flat-screen TV is featured. The apartment offers a children's playground. Guests can also relax in the garden. Paris is 10 km from Towandhouse. The nearest airport is Paris - Orly Airport, 15 km from the accommodation. Kyriad - Créteil - Bonneuil-sur-Marne in Bonneuil-sur-Marne features 3-star accommodation with a shared lounge and a bar. All rooms feature a flat-screen TV with cable channels and a private bathroom. The accommodation features a 24-hour front desk and free WiFi is available. At the hotel, every room includes a desk. All rooms feature a wardrobe. A buffet breakfast is available every morning at Kyriad Bonneuil-sur-Marne. You can play billiards at the accommodation. Paris is 17 km from Kyriad - Créteil - Bonneuil-sur-Marne, while Marne-la-Vallée is 36 km away. The nearest airport is Paris - Orly Airport, 14 km from the hotel. Situated in the town centre, 25 km from Orly Airport and easily accessible by the A4 and A86 motorways, the Campanile offers comfortable rooms with free Wi-Fi internet access. The practical guestrooms are equipped with modern en suite facilities and satellite TV. They provide you with a functional living space for the duration of your stay. Enjoy traditional cuisine and children's menus in the hotel restaurant. Lunch is served from 12:00 to 14:00 and dinner from 19:00 to 22:00. Room service is guaranteed (with reservation) until 22:00. A copious breakfast is also available and served daily. Free parking is provided at the Campanile Créteil - Bonneuil Sur Marne, making it easy to explore the Île-de-France region by car.The Campanile is also only 2 km from the RER train station. Located a 17-minute drive from Paris, this hotel features a business centre with equipped meeting rooms, a terrace and free Wi-Fi. Disneyland Paris is a 25-minute drive away while the Parc Astérix is a 30-minute drive away. Each air-conditioned room at Campanile Nogent-Sur-Marne includes a private bathroom, coffee and tea making facilities and a satellite TV. A buffet breakfast with fresh fruits and pastries is served daily in the dining room. The on-site restaurant proposes a regional cuisine, children menus and buffet-style starters and desserts. The automatic check-in and private parking are available at this Campanile hotel. Nogent-Le Perreux RER Station is 1 km away and the A4 Motorway access is 650 metres away. Hôtel Cinepole is a cinema-inspired hotel in Jointville-le-Pont, just 300 metres from the River Marne. You can walk the 20 minutes to the nearest RER train station and take a direct train to the centre of Paris. The rooms at Hôtel Cinepole feature a flat-screen TV and free Wi-Fi access. Each one is decorated in a contemporary style and also has an en suite bathroom with free toiletries. A continental breakfast of fresh fruit, French pastries and ham is available every morning at this hotel. You can also relax with a drink in the bar or sit on the terrace and admire the flowered garden. A 24-hour reception, luggage storage and newspapers are just some of the other facilities available at Hôtel Cinepole. Boat trips can be organised on site and private parking is available with an extra cost. Close to the centre of Paris and Disneyland Paris, the eco-friendly Aparthotel Adagio Access Nogent sur Marne offers comfortable, self-catering accommodation and free WiFi. The spacious and modern apartments are fully equipped with en suite facilities, satellite TV, a work desk and a kitchen area. Situated close to the train station, shops, a theatre and the banks of the Marne river, Aparthotel Adagio Access Nogent is a good base from which to explore the surrounding area. Maison Romantique is situated in Le Perreux-Sur-Marne, 11 km from Paris. This bed and breakfast is a 15-minute walk from Nogent le Perreux Train station, providing direct access to Paris within 30 minutes. Free WiFi and free private parking are featured at the property. The room offers views of the garden, it also features a seating area complete with a desk and a private bathroom. Disneyland Attraction Park is 32 km from Maison Romantique, while La Vallée Village shopping centre is 26 km from the property. The nearest airport is Paris - Orly Airport, 17 km from Maison Romantique. Below here is the hotels map of Saint-Maur-des-Fossés. Names and details of Saint-Maur-des-Fossés hotels can be shown on the map clicking on the prices icons.